Rack and Pinion Made In The USA. 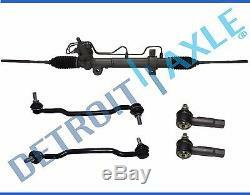 Complete 5pc Power Steering Rack & Pinion + 2 Outer Tie Rod + 2 Sway Bar Links. 1x Power Steering Rack and Pinion. 2x Driver and Passenger Side Outer Tie Rods - ES3438. 1x Driver Side Sway Bar End Link - K90352. 1x Passenger Side Sway Bar End Link - K90352. Sent to the 48 Continental States to return your old Rack! Rack and Pinion Specifications Condition: Remanufactured in U S A. Not what you were looking for? To find the right part! New Oil and Lip Seal New Oil and Lip Seals installed to ensure quality performance. New Teflon Rings New Teflon rings installed on Spoon valves to restore internal sealing of rack and Pinion. Surfaced to OE Specifications Racks are finished with proper surface to prevent leaking and to prolong life. Air Tested to Ensure Reliable Performance. Hydraulically Tested to Ensure Internal By-Pass for Both High and Low Pressures. Road Simulated for Proper Functioning. Detroit Axle, offers parts and accessories for the perfect combination of quality and value. Detroit Axle offers cost-conscious customers a full range of parts to a broad range of applications. Detroit Axle offers an extensive lineup of Wheel Bearings, CV Axles, Power & Manual Steering Rack & Pinions, Gear Boxes, Quick Struts, Drive Shafts, Prop Shafts and much more. Detroit Axle offers an extensive coverage of bearings for a large range of automotive and heavy-duty wheel end applications. Our Products are manufactured in ISO 9000 / 9001 / 9002 certified facilities. Detroit Axle products delivers the look, feel, fit and performance of OE. Manufactured with Internal bearing seals that are specifically designed to combat all types of road conditions to keep debris out and keep the bearing turning. The item "5pc Rack And Pinion Outer Tie Rod Sway Bar Link Kit For Nissan Maxima Altima" is in sale since Monday, June 27, 2016.